Important Info: This website does not wish to promote this or any other projects. Recently a lot of complaints have been raised againt Wave Infra group related to their project Wave City NH-24. The key issues against the promotor company has been namely, 1) Non-allotment of plots to majority of orig applicants (year 2005) even after 7 years wait, 2) Unethical practices by changing the orig priority list by asking more money, 3) Slow pace of work since 2005, no road connectivity from NH-24 to site or completion of internal sector roads, no timebound site deveopment since 2005, 4) Non-transparency in the allotment of plots as premium location plots sold at high prices bypassing the orig applicants. Moreover orig applicants allotted remote location plots (Sec 15) after 7 years of wait, 5) Finally, there are many court cases against the land acquisition for the project and the company has not been forthcoming on the nature of land acquisitions and how much land they have in actual possession. In this background, we request everyone to do due diligence while dealing with the company. It was last year that at ncrhomes.com we noted that “Chadha group which is till date known for building wave cinema and centre stage mall in Noida is all geared up to be counted amongst the biggies of NCR like DLF, Unitech and JP. Watch this space.” Here is the link of that post. Though it took another year for Wave Infra to start creating big waves into Indian real estate, but we have had this inkling for some time. While some of the biggies in Indian real estate are finding it difficult to carry their own weight, Wave Infra is emerging as a vibrant and dynamic group which seem to have all the firepower to be counted as the best in NCR. The cherry on the cake for the group seem to be their ever dependable customer service.Time would tell if Wave Infra could really DELIVER this dream successfully. Watch out for this space. NOIDA: Six months after the Noida Authority sealed the multicrore City Centre deal, Wave Inc, the private developer of the project laid the foundation stone of the project on Wednesday, thus launching it officially. The official spokesperson of Wave Inc said the first phase of the project will be complete by 2015. The City Centre project, spread across sectors 25A and 32 is touted as one of the largest multi-purpose commercial hubs in the NCR and will house offices, banks, hotels, retail spaces, shopping, dining and world-class entertainment options as well as service apartments among other things. A parking area to accommodate over 40,000 cars will also be developed within the premises. Wave Inc will now develop the land commercially and then sell off plots. The Authority will earn revenue of around Rs 8,000 crore from the project. 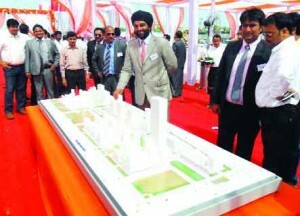 Wave Infratech today performed the Bhoomi Pujan and Paath for its new project – Wave City Center at Sector 32 and 25(A), Noida. Envisioned to be an attraction du jour, Wave City Center is a futuristic project by Wave Infratech, one of India’s leading real estate developer. Ideally located in the heart of Noida, this commercial development will be first-of-its-kind in India, spread over sprawling 152 acres, in Sector 25(A) and Sector 32, Noida. Wave City Center will be a unique combination of swanky fully-furnished offices, hotels, retail spaces, shopping, dining and world-class entertainment options to provide an unmatched experience. The development of Wave City Centre will involve approx. 4 crore sq. ft. of built-up area. The project will provide 90 Lakh sq. ft. of Serviced Apartments and 90 lakh sq. ft. of Residential facility apart from ample premium office space, range of 5-star and 4-star hotels and parking spaces for 43,000+ cars. Wave Inc. is a diversified group with business interests spanning sugar manufacturing; distilleries; paper manufacturing; malls – development & operations; multiplexes – development & operations; liquor retail management and Coca Cola bottling plants. The Group’s other prominent residential projects under construction include WaveGreens, Moradabad; Wave Lakewoods, Hyderabad; and Fairlakes, Mohali. Some of the big ticket commercial real estate projects that Wave Inc is developing in the business district of Noida for office and retail space include Wave One and Wave eleven in Sector 18, Noida. NEW DELHI: Wave Infrastructure today said it has paid about Rs 375 crore as stamp duty for registration of about 151 acres of land in Noida, which the company had won in the country’s biggest land deal for a whopping Rs 6,570 crore. In March this year, Wave Infrastructure had bagged 6.14 lakh sq meter plot for Rs 1.07 lakh per sq meter at Sector-32 and 25A from Noida Development Authority, outbidding real estate firms Amrapali and The 3C Company. “We have deposited about Rs 375 crore as stamp duty for registration of the land,” Wave City Executive Director R K Jain told PTI. He said the registration process is expected to be completed by tomorrow. However, it could not be ascertained whether the stamp duty paid by the company is an all-time high. It is a mixed-use land where the company would develop housing, commercial complexes, entertainment city and hotels. Jain said the company would launch the project by end of this year but refused to share further details saying that the project was in the planning stage. Besides real estate, Wave Group is into entertainment, sugar, liquor and paper businesses. In 2008, BPTP had bagged 95 acres of land in Noida for Rs 5,006 crore through an auction, but the deal fell through as the company was unable to make the full payment. However, the Noida Authority allotted some portion of land to BPTP, equivalent to the amount paid by the company. Among other major land deals in the national capital region, DLF –the country’s largest realty firm — had bagged a 350-acre plot for Rs 1,750 crore in Gurgaon in 2009. DLF had acquired 38 acres in the heart of Delhi for Rs 1,675 crore in 2007, while Unitech had won 340 acres in Noida at Rs 1,582 crore in 2006. Please follow below link on another big project of the Wave Infra known as Wave City NH-24.